From Proto Rarotongan/Māori *Hange Geniostoma spp. (Loganiaceae). Note: See the other linked pages (highlighted at the top of this page) for more information about the ancestral name, its modern descendents, and the plants they denote. The hangehange is a shiny-leaved, much-branched shrub growing to about 4 metres tall. The bark and sap of this tree are reputed to have some medicinal value, and were employed in treating itches of the skin. The hangehange is found throughout the North Island, and in the northern part of the South Island. Like the other Geniostoma, it bears small sprays of miniature flowers with a characteristic 5-pointed star shape from the leaf axils. In Aotearoa hangehange flowers in summer. Why this name is also occasionally applied to the hīnau (Elaeocarpus dentatus) must remain, for now, a mystery. Possibly it is because the bark of both is reputed to have properties for the effective treatment of skin diseases. The trees are very different in size and form, but glanced at from afar there may be a vague resemblance when they are in flower - but not one that would stand any kind of careful scrutiny! 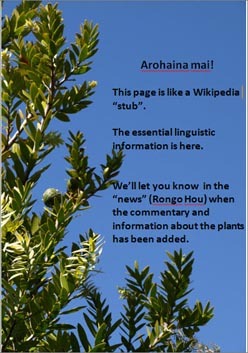 Further Information: There is some information about the medicinal properties of hangehange in Tony Foster's Plant Heritage New Zealand (see Bibliography). 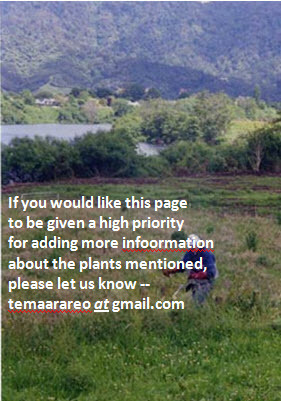 The NZ Plant Conservation Network site has the essential botanical descriptions of the three subspecies of Geniostoma ligustrifolium and interesting photographs. Photographs: Ā te wā, ko puta atu ētahi whakaahua!